With the conclusion of the 2010 Masters tournament at Augusta National, the golfing world has quite an event to remember for years to come thanks to two participants. Tiger Woods and Phil Mickelson are your typical competitive duo in any athletic arena: Team Tiger or Team Phil, but not both. Constantly battling in the various statistical rankings on the PGA Tour, very few will disagree that Mickelson and Woods are the top players on Tour at any given moment. With Mickelson's third green jacket victory this week, however, we saw a different storyline that runs much deeper than fairways and greens. Woods might have one additional green jacket in comparison to Mickelson, but what Phil has that perhaps Tiger will never match is his ability to be successful in the midst of family stress and crisis. The Mickelson family's recent battle with cancer is something that no family should have to endure, yet so many have. The same can be said for the recent Woods' family crisis, but for other reasons. Phil took a brief hiatus from the game in order to be with his wife, Amy. Tiger obviously did the same in order to save anything he might have with his wife, Elin. The biggest question on everyone's minds upon their respective return to the game was also obvious: how would each man perform and be able to focus not on family, but on their sport on the grandest of stages? As we have now seen with the conclusion of Tiger's return at the 2010 Masters, a return to competition can be difficult. Phil also struggled during his return to the game last season, and only now can he say his game was completely in line to how he would expect it to be. Furthermore, despite a strong showing with a tie for fourth place in a Major, Woods also expressed his disappointment in his game when compared to his expectations. Then again, nobody really thought their return to golf would be a piece of cake. The main difference is how both men will continue to play while struggling with the uncertainty that surrounds them at home, albeit for very different reasons. Golf is a funny game. Not many sports can touch both the competitive and personal side of the human condition quite like this game. Fans have his or her favorite golfers, and also their favorite golfers to hate. 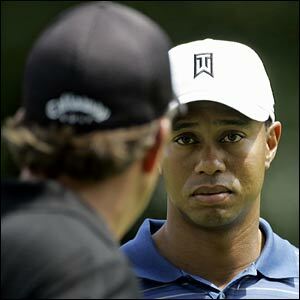 Personally, I am not a very big fan of Mickelson as a player; I am a very big fan of Tiger as a player. After watching the conclusion of this year's first Major, however, I realized exactly what the biggest difference was between these two great golfers: integrity. Phil has it, Tiger does not. At least not now. One thing I will not question is the love each man has for his wife. While one might show it more than the other in the opinion of all fans, only those two men know exactly what is going on in their respective marriage. Today, however, one thing is very clear: life does go on, and there is a lot of good golf left to play.